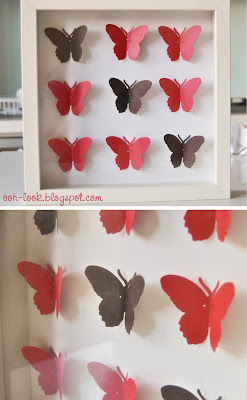 If you're a visitor to markets and craft shows, you may have noticed how popular are paper butterflies stuck into a wooden box frame. There are so many different designs around these days, and they've always appealed to me because of their simple, clean style. In fact, part of the appeal of the butterflies (or birds, or whatever design is chosen) is that they are sometimes handcut from vintage papers - very delicate yet bold. So of course I think to myself "I could do that!". This type of decoration has been around for years, and I first thought of making my own about 2 years ago. However, with one thing and another (aka 'procrastination'), I've only just completed the project. As it was, both pictures took less than an hour to make. The box frames are from IKEA (bought, er, 2 years ago). The butterflies were cut from various scrapbooking papers and from an old crappy novel I was about to throw out (Fingersmith by Sarah Waters, if you're interested). To save time, I used a Cuttlebug machine with a butterfly die cut - so much quicker than handcutting, and less prone to error and frustration. The butterflies are attached with 1/2" quilting pins on foam core board. The final effect looks pretty good, I think. The feeling of relief at finally getting them out of the way is... priceless! 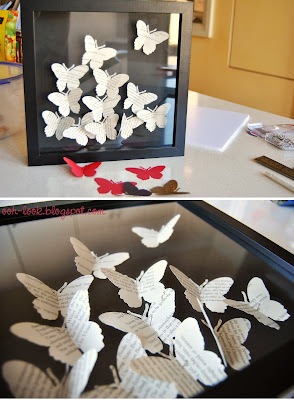 Butterflies cut from an old yellowing novel, attached to black foam core board. Butterflies cut from scrapbooking paper, on white foam core board. Getting a bit of a craft display going on the upstairs landing. Oh Belle..... These butterflies are beautiful! I have seen them at Surry Hill's Orson and Blake and fell in love with them. I hate to think what they were charging for them at Orson & Blake! Love your butterfly artworks. They're absolutely stunning! Cuttlebug machine? Never heard of that, where do you get one of those? oh they are so cute, I just love the effect that they give. but they look a little sad to me, like butterflies trapped in a box, they need to be free. I think you should make a few and scatter them around, that way it looks like some are free to roam. Belle they are so pretty... I love making things. What a great gift for someone too. ahh pretty :) I really like the ones from the novel. Hooray for finishing super draggy onny projects, woo! Love these =) They're so pretty, have depth and are most definitely NOT creepy like the pinned preserved ones! This is so bad of me but I have that book and agree - it looks better as butterflies than on a bookshelf!! Beautiful work Belle! What a gorgeous idea! So simple and so elegant. I love both designs. They'd make such a lovely gift too. Totally dig this. 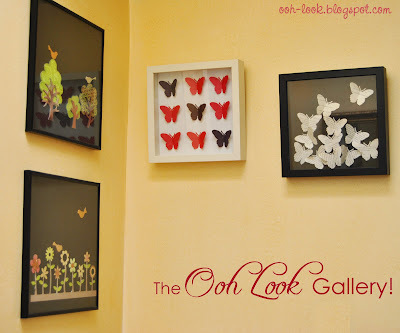 LOL...the "Ohh Look Gallery." Nice! what a cool idea! very nice blog! They look great - very creative! I particularly like the ones you made out of an old book. Wow! They are so beautiful! Amazing job Belle. I love butterflies too-we had feather one on our wedding invitations. Even MR NQN couldn't object to the overt girliness and approved. I'm sure he'd like this too! OMG they are so beautiful! I love butterflies too! Thanks for the inspiration, I'll have a crack at them soon, they'll make perfect gifts as well. Stunning..
hi Ellie - the ones at Orson and Blake are lovely, aren't they? The paper they use are so pretty. hi John@heneedsfood - talk about pricey, I think the ones at O and B retail in the triple digits! A Cuttlebug is a little machine that is used to cut out (and emboss) cardstock. You put a metal stencil in and crank a handle and out it pops. Cuttlebugs are available from places like Lincraft, and they are so much fun! hi Maria - paper butterflies are definitely better than real ones. Though if you saw them close up, you'd realise how unlifelike my ones are! hi A cupcake or two - making stuff (or cooking) is such a great outlet after spending so much time at boring work. What types of things do you make? I'd love to see some! hi mlle delicieuse - those insects are sooo creepy, aren't they? And don't get me started on the spiders, erk! hi Betty the hungry girl - thanks, the only reason I have the crafty corner is cos there are already hooks on the wall. Very handy! hi Trissa - haha, I don't think I even finished the book. And the TV series of it wasn't any better. hi Helen - yes, they are quite quick to make, so would be ideal gifts. I've given other designs as gifts, too. hi Ravenous Couple - thanks for visiting. I really like your blog, too. hi Agnes - the book butterflies are great. A little bit different, I think. hi Lorraine - I can imagine your wedding would have been beautiful. Feather butterflies sound rather unusual! hi BB - thank you! hi Betty - you could also use a butterfly punch. Martha Stewart makes several good ones. Good luck! hi Phuoc - hope you give them a try. And let me know how it goes! Hi Belle - they look amazing. Funny that I wanted to do the SAME thing after seeing those at O&B! I, too, bought some IKEA frames home and then procrastination kicked in. Where did you buy the butterfly punch? hi foodwink - I'm glad I'm not the only one with the procrastination bug! 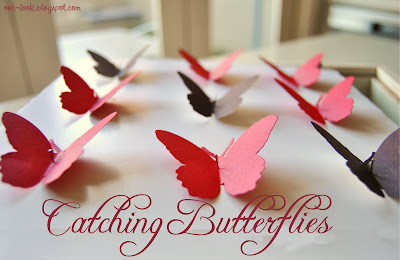 I used a Cuttlebug from Lincraft to cut the butterflies, but you could also use a punch. Try annascraftcupboard.com.au for a Martha Stewart butterfly punch.